The emerald ash borer, or EAB, is an invasive species of beetle native to Asia that has been wreaking havoc on America’s population of ash trees for the last decade. In 2002, reports surfaced out of Canton, Michigan that the EAB was officially discovered for the first time in North America. Since then, it has gradually made its way east, with 22 states now claiming detection of the bug. Although the beetle infestations only move about two or three miles per year on their own, the transportation of infested firewood has resulted in infestations ranging from Kentucky to Quebec. On April 18 2013, researchers found the bug east of the Hudson River, and in November it was discovered in North Andover in Essex County, Massachusetts. This poses a serious threat to America’s ash tree population, and New England remains one of the most fertile sources for the wood. In Michigan, the first state to report EABs, the pest has destroyed over ten million trees, and millions more have been destroyed in other territories. 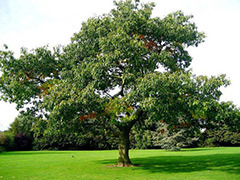 The EAB larvae disrupt the conductive system of ash trees by boring through the bark, managing to kill a healthy tree in just three to five years. While public awareness has been spreading about the bug, and the enforcement of fines has been instituted to prevent travelers from transporting firewood that may contain the critters, little progress has been made in slowing the reproduction of EABs. This is largely due to the fact that since the beetle hails from Asia, it lacks an established domestic predator. Researchers are now beginning to combat this problem by introducing stingless wasps into the environment of the beetles. The parasitic wasps lay eggs in places where EAB larvae bore through ash word, and the eggs later hatch with wasp larvae that devour the beetles. Just a few days ago, a glimmer of hope was reported out of Minnesota. The wasps have developed in places where EABs had previously been reported, indicating that the state’s introduction of the wasps in 2011 was successful. It is estimated that the emerald ash borer, thought to have migrated to America by way of wood packaging and crating from Asia, will ultimately cost the US economy billions in revenue. The bug has already had a serious effect on the production of baseball bats, which are primarily made of ash wood. With new infestations reported in different American counties nearly every week, there seems to be no end in sight for the extended North American stay of this invasive species. Posted on December 23rd under Global Ecology.